What do you want to do after a long day of wandering around a city? To me, it's time for local food experience. Feed yourself to have more energy to discover Da Nang as this pretty city has so much to offer. 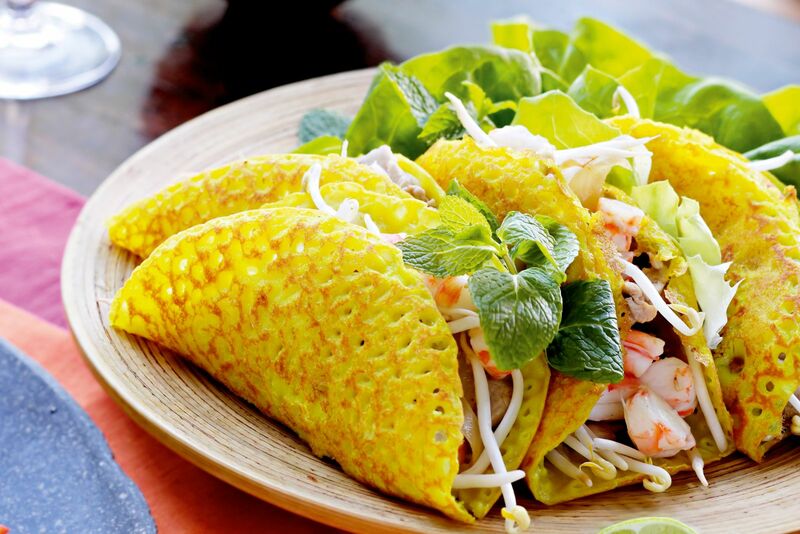 Follow this list of 10 must try food in Da Nang and you will be not disapointed. Mi Quang or Quang noodle is one of the most enjoyable foods for both domestic and foreign tourists. There are tens of eateries selling Quang Noodle in Da Nang. However, the best place to enjoy this dish is Mi Quang Ba Mua. There are many options for you to choose as noodle with beef, chicken, pork, shrimp, snakehead fish or eel. What makes this dish stand out is the broth which contains flavor of main ingredients as beef, chicken or fish and fresh vegetables. Quang noodle is served with lime, green chilies and rice cracker to enhance its taste. Mi Quang Ba Mua is opened from 6:30 a.m to 9:30 p.m.
Tran restaurant is well-known in Da Nang mostly for its banh trang cuon thit heo – a dish of pork and vegetables wrapped in rice paper. This dish is ranked as the specialty of Da Nang cuisine. Besides, its menu is endless with other Vietnamese specialties as Bun mam – Vietnamese gumbo, Mi Quang – Quang noodle, water fern cake, seafood hot pot and beverages. Currently, the brand "Tran Specialty" has more than 2 restaurants in Da Nang city. Add: 04 Le Duan street. Once you visit Da Nang, you need to try Bun cha ca – Fish cake noodle. Local people have it for breakfast, lunch and even dinner. As Da Nang is a seaside city, it ensures to meet the demand of locals for the freshest seafood. This is why the fish cake for Bun cha ca is always in the best condition. The restaurant at 109 Nguyen Chi Thanh with its 40 - year long of making fish cake is a great option for a perfect refreshment on a boring day. Add: 109 Nguyen Chi Thanh street. Next is another inviting local food in Da Nang - Pancake (Bánh xèo). It's well agreed that Banh Xeo in the Central of Viet Nam is the best. This food is a basic combination of meat, fried pancake, shrimps and vegetables. In some southern cities, Banh xeo is served with fish sauce but in Da Nang, people use the sauce made from peanut, pork liver pate and fish sauce. It can highly enhance the relish of this dish. "Noodle" is a common word to call many different foods in Viet Nam. Each kind of noodle has its own favor. Nowadays, more and more tourists make their way to look for a fermented thick Vietnamese vermicelli soup called “Vietnamese gumbo”. Its main ingredients include vermicelli, grilled pork or beef, fermented pork roll, boiled young jackfruit, shrimp paste, peanut and vegetables. Add: 424/03 Le Duan street. Not many tourists have chance to truly encounter "a Vietnamese traditional meal". What makes that term special? It is the selection of many kinds of foods which are beautifully decorated and cooked in a traditional style. For each bite, you can feel a taste of sentation in your mouth. Where to eat like a local? Com Nieu Nha Do should be a good choice. This restaurant offers foodies a chance to go through the real Vietnamese food. One of the most famous Vietnamese dishes has got to be Rare veal. In fact, not many people know the secret to make a toothsome rare veal as the art to singe a veal is almost a secret. Fortunately, eating this food is not a secret for sure. You just need to put some slices of barbequed veal on the rice paper, wrap it with vegetables, and dip it into fish sauce to have a mouth watering bite. It's cheap, filling, delicious and widely available in Da Nang. Banh canh ca loc is rice noodle soup coming with an additional flavour of snakehead fish. This dish is a highlight for all foodies as it is more popular in the Central of Viet Nam. The food quality in Thanh Huong restaurant is really good for the price. Your trip to Da Nang will not be complete without trying seafood. As mentioned above, Da Nang has full of the freshest seafood from local fishermen's catches in every early morning. There is a large choice of seafood in this beach city. To get a real touch with Da Nang seafood, Hai san ba Thoi is a good suggestion for you. What you are served in this restaurant is a superb value for money. Add: 96, 98, 100 Le Dinh Duong street. Bun rieu cua – rice vermicelli soup with paddy crab is a popular dish in the north of Vietnam but soon becomes well known throughout the country. This dish is brightly in color and fresh in flavor. If you have chance to visit Da Nang, don't miss this one!